FOUL STENCH: The overflowing sewer at her Morningside home has Megan Richardson holding her breath every time it rains. To book ANSA to perform a service for you click here. Every time the heavens open, Megan Richardson holds her breath. For the past two years, the backyard of Ms Richardson’s Morningside home has flooded with sewage after heavy rain. A multitude of plumbing work, council visits, insurance claims, letters and phone calls have failed to fix the problem she says is caused by ageing pipes clogged with fatty deposits and tree roots. “It’s really just horrifying because we got home after the most recent torrential downpour and the toilet in the laundry was almost overflowing with water and the bathroom sink and kitchen sink had dirty water in it,” she said. “It just makes you cringe because you don’t want toilet water everywhere? Queensland Urban Utilities spokeswoman Cheryl Gray said it planned to undertake an electronic camera inspection to assess the condition of the mains. Ms Gray said the inspection was a high priority but the utility company needed to wait for the current wet weather to end before the camera could be passed through the pipes. Ms Richardson said sewage first overflowed into her Lawson St house in 2008. After replacing carpets and furniture, her family installed a disconnector pipe which funnelled overflow into the backyard instead of the home. “In my opinion, the fact it first happened in 2008 and that it’s been occurring ever since, l think has to do with the big development happening in the area and the sewer system hasn’t been upgraded to cope,” she said. Ms Gray said development did affect sewerage capacity, but applications were checked for any impact on the sewerage system which was upgraded if needed. The SQID ® (Stormwater Management Device) range of products is designed with durability and UV stability built-in. Constructed of polyethylene and stainless steel, these products are designed to last. Once manufactured and installed, these products contribute no more pollution to the environment, and are made of 100 percent recyclable materials. Authorities have begun to act to ensure that storm water pollutants are captured at the source. 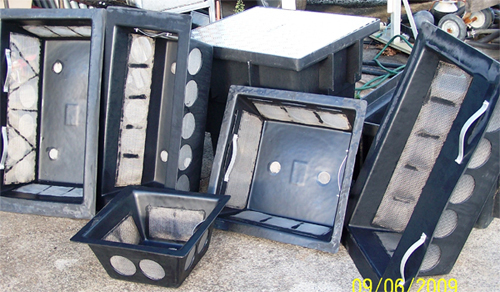 With this in mind, the SQID ® range of litter and sediment traps (LST) were developed. The SQID® litter and sediment traps would become an integral part of a storm water treatment plan that councils are being urged to implement. (See: Modern urban storm water quality management plans and guideline, March 2001, Queensland Government Environmental Protection Agency.) It is envisaged that this will help reduce the impact of urban development on the ecosystem. This will greatly improve the likelihood of sustainable development. Developers will also benefit by installing the SQID ® systems, as this may facilitate development plans if they are seen to be ecologically sound. The benefits to the environment are immeasurable. Many of these have been discussed in lengthy papers and reports by environmental agencies over time. Some of these include the reduction of discarded and trimmed vegetation that depletes the oxygen levels in water as it decomposes, thus contributing to the blue green algae problem. Cigarette butts are stopped at the source. These cause immeasurable damage to the ecosystem as they have life expectancy far exceeding that of natural components. Plastic bags, broken bottles, discarded wrappers, and all forms of litter otherwise known as gross pollutants are stopped at the source. All these items have been found to be trapped by the SQID ® systems. It has been found with field observation and experiments that as the litter and sediment is trapped, there is a tendency for Pollutants such as nutrients, trace metals, free oil and grease as well as smaller particles below 2 mm to be entrapped in the litter is well, thus reducing further pollutants to the ecosystem. The systems are primarily designed to capture and maintain sediment and pollutants from areas such as industrial areas, car parks, courtyards, driveways and kerbside channelling. There are many various applications that the SQID ® systems may be useful.